A two-stage culture method employing Lactococcus.lactis IO-1 and Alcaligenes eutrophus was developed for production of poly-β-hydroxybutyric acid (PHB) from xylose. In this method, xylose was converted to L-lactic acid and acetic acid by L.lactis IO-1, and then the organic acids were converted to PHB by A.eutrophus. 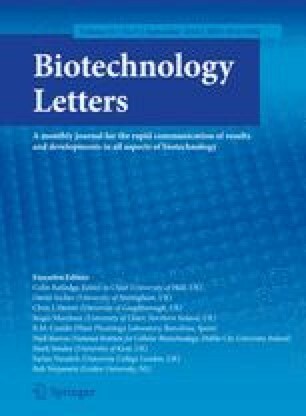 When the supernatant of the IO-1 culture broth, containing 10 g·dm-3 L-lactate derived from xylose, was used as medium for A. eutrophus, the concentration of cells increased to 8.5 g·dm-3 in 24 h and 55% of the content in the cells by weight was PHB.